The purpose of this research is to identify the latest television trends and their impact on the Dutch television market. 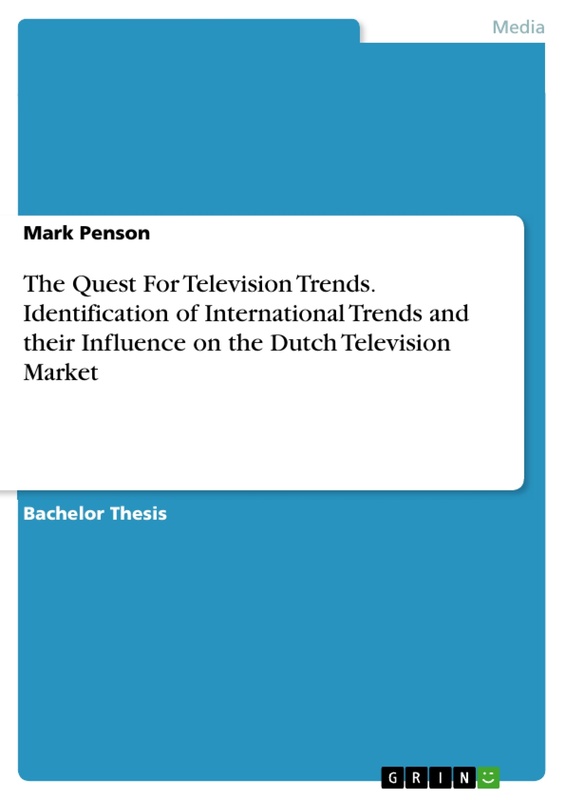 In order to identify the latest trends, two research questions were formulated: “Which trends can be recognized on the international television market?” and “How will these trends influence the Dutch television market?” A qualitative content analysis has been conducted in which ten leading channels and producers are researched. The Content Analysis resulted in six major trends: Scripted Media, Dating, Interactivity, VOD, All-in-One App and Drones. Ten professionals discussed all trends and their potential impact during personal interviews. The professionals agreed that VOD (Video On Demand) would have the largest impact on the Dutch television industry. Besides that, the VOD trend was linked to the popularity of the Scripted Media. Most of the trends seem to ignite from modern technologies such as Apps, Internet websites and Social Media. As a result of my research, I recommend my company (Dutch Camels Media) and the media industry to focus on Internet as the future preferred platform for television. Television shows can be sold online, shows can be promoted online and VOD channels could be launched here. Besides that, inspiration for new television shows can be found in simple videos, discussions or forums online. I also recommend constantly search for new trends. Professionals could not agree if VOD will be the end of linear television or not. Further research is necessary to gain more insight in this matter. The findings of this research document resulted in many new format ideas. The world around us is changing rapidly. Some years ago, it was very modern to have a television with colours instead of a black and white television. Nowadays, it is modern to have a flat screen with ultra high definition colours. Back in the old days, people rented videotapes in the video store to experience the cinema feeling at home. Currently, video stores are almost all bankrupt because of the fact that even the follow up of the videotape, the DVD, is out of date. Companies try to adjust their business plan to these rapid changes. Videoland for example changed their complete business plan. First it rented out videotapes and DVDs, but now it is an on-demand platform (Videoland, 2015). The Dutch TV-channel RTL owns Videoland. The channel states that the acquisition of Videoland is a result of a new trend: “It is for the first time in the Netherlands that we create series and movies for a streaming service only. However, we saw that this trend was already successful in the USA” (Nu.nl, 2015). In the world of television, the word trend is often used and considered an important component of a business strategy in media production. According to Oxford Dictionaries, a trend is: “a general direction in which something is developing or changing” (Oxford Dictionaries, 2015). 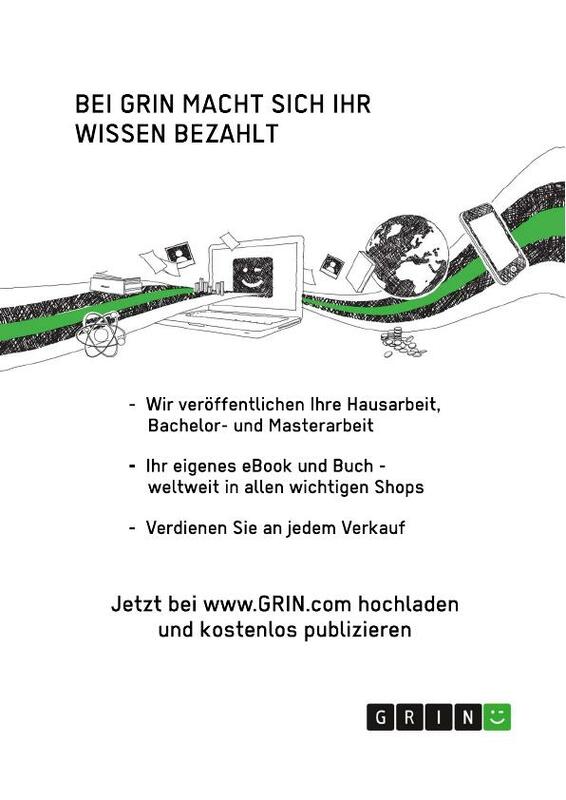 When RTL read about the first results of video-on-demand in America, they started to implement the new trend in their business plan. Similar to RTL, many channels, production companies and other media businesses aim to identify existing trends in their field of business and try to adjust their future plans towards these trends. One of these companies is Dutch Camels Media. This is a young television production company situated in Amsterdam. The company has big plans for the future, but wants to be sure that these plans also comply with the newest international television trends. With this in mind, Dutch Camel has invited me to research current international television trends and how these trends may possibly influence the Dutch television market. Dutch Camels Media is a Dutch production company with ambitious future plans. The company wants to expand, create more shows and be more active on the market. It is of utmost importance that their business strategy complies with the modern international media trends. Dutch Camels Media has commissioned me to identify international media trends and their impact on the Dutch market. It is not easy for Dutch Camels Media to research this topic because this kind of research usually involves other production companies and even rivals. So far, no research has been done on recent media trends and the influence of these trends on the Dutch market. The objective of this research is to gain more insight in the current international television trends and what their influence is on the Dutch market. My research aims to provide Dutch production companies (such as Dutch Camels Media) new insights on how they can position their company strategies in relation to these new trends and developments. RQ1: Which trends (format trends and technical trends) can be recognized on the international television market? RQ2: How will these trends influence the Dutch television market? Chapter 2.7 explains how the Research Questions are related to the literature. Trends in the television industry are relevant to many television related companies. Channels (broadcasters), production companies and individual producers may benefit from this research. They will be informed of the latest television trends and how these trends will have impact on the Dutch market. Companies can use this research in order to change their business plans according to upcoming trends. Dutch Camels Media is a Dutch television production company that is located in Amsterdam. The company recently changed its name because Flare Media and North Sea Camel decided to join forces. The focus of the company is on a dynamic mix of television (scripted as well as non-scripted) and Internet content. “As a total fulfilment production company, we play a prominent role in creating and producing ideas” (Flare Media, 2015). Dutch Camels Media produces and invests in scripted and non-scripted international television productions and broadcasters. The company has three main focus areas: branded content with concept driven formats, unscripted character driven formats and scripted series. I work in their creative team that develops the creative concepts of the company. At this moment, Dutch Camels Media is expanding. The company had a successful MIP (International Format Selling Days) in Cannes (France). Several new shows are in production and many new connections are being established. Besides that, the company already had a couple of shows on television. Their most famous productions so far are Recht in Nederland (Justice in the Netherlands) on SBS6, De Dokters (The Doctors) on RTL4, De Roelvinkjes on RTL5 and Maurits & Mimoun vragen om problemen on FOX. This research is all about trends in the media environment. What is the meaning of the word trend ? Author Barbara Arena (2001) wrote a book in which she defines what a trend is: “A trend (or a fad) is any form of behaviour that develops among a large population and is collectively followed enthusiastically for a period of time, generally as a result of behaviour being perceived as popular by one’s peers or being deemed cool by social media”. Researchers Brown, Goetzmann and Kumar (1998) went a step further in their definition of what trends are when they researched the Dow theory. The Dow Theory is a theory about market trends and market movements. This theory states that there are three types of trends: major trends, minor trends and short swings. The major trend is also known as the main movement. The main movement or major trend may last from less than a year to several years. The medium swing may last from three days until three months. The last category of trends is called a short swing. Short Swings only last for a few hours and are common in the modern society (Brown et al, 1998). An example is Twitter, where a topic is trending for only a few hours. In this research, I will mainly focus on the Main movements or Major trends and Medium Swings. According to television producer and creator Afman (2015), two types of television trends can be identified: television format trends and television technical trends. “It is an unwritten but simple and clear rule in the industry, that we cannot compare a technical trend with a format trend. A technical trend is related to the production of a television show, while a format trends relates to the content elements of a television show”. Television expert Redden explains this unwritten rule further. “Format trends are moments in which the audience tends to watch more shows within a particular genre than usual. Technical trends are moments in which certain production techniques are used more than usual” (Redden, 2008). Redden (2008) tries to explain this television theory by giving a clear example. The reality show format is such an example. In the late nineties, reality television became immensely popular. “Reality television is focused on observing other people. This may be seen as part of a trend towards personalization across the media”. A trend towards personalization in the media was the key factor for the reality television success. Reality television is always focused on following the lives of certain individuals. If there was no trend towards individual stories, the chance that somebody would come up with a show about personal stories is small. In this case, the format trend would be, the trend to follow personal stories. The technical trend would define the way that these shows are filmed. For example, the trend to film the main character continuously, without clear cut moments (Redden, 2008). According to television researcher Lee Harrington (2008), format trends depend on the promotion of the particular genre. He claims that the industry of television uses imitation more than innovation. Network programmers legitimize their decisions by making a group of genres that develop the global identity of a channel. The promotion of a format genre in order to make it a successful and therefore trending is called Programming Strategy. Harrington (2008) explains this strategy further: “Genres are production formulas that allow the routinized production of television series and provide heuristics for estimating the potential success of proposed programs based on the success of previous programs within the same genre”. In other words, if one or more programs within a genre prove to be popular with the audience, more shows within this genre should be promoted to create a successful trending formula. However, in order to use the strategic planning strategy, at least one success within a genre has to be found. The key question is: what makes a format successful? According to television researcher Pierre Ziemniak (2014), more and more re-packaging of previously tried formats can be observed. “One of today’s big trends seem to be mixing well-known formats with unexpected elements” This evokes the next questions: When is a format element unexpected or unique or when is a format popular? Edwin Komen et al (2009) argue that unique elements are different from unique themes: “In a show, each element that compromises the uniquely creative web of fabric that establishes the formatted program’s themes, framework and public identity should be listed”. In other words, a unique show is a combination of theme, framework and its identity. If one of those elements is unique, the show itself does not have to be. However if the creative web of fabric is created in a way like never before and therefore the identity is different, then the show itself could be considered unique. Besides format trends, also technical trends have their influence on the media landscape. Technical trends are the persisting technical movements in the television industry. An example is the development from videotape to DVD or the introduction of 3D television. Yu and Zheng (2006) researched a technical trend called VOD – Video on demand—and came to the conclusion that “Multimedia streaming has become a dominant factor in today’s internet and video-on-demand is one of the most promising killer applications for the internet of the future”. VOD shows that the viewer wants to be in command of his or her own television schedule. That is also the conclusion of researcher Pyungho Kim (1999): “Interactive television advertisements new data services to the television technology. With this data, an audience member could affect the program being watched” Instead of a one-way direction from television to audience, the audience now wants a so-called back channel to the television. This can be achieved in the form of texting or mobile applications. The first time that such a back channel was used was in the show Big Brother (Endemol). In this show, viewers at home could vote which contestant should stay in the game and which contestant should go. Later on, more shows, such as Pop Idol and others, created a back channel in their shows. Other technical trends are related to the creation of a show. The physical creation of a show (cameras and equipment) is also considered to be technical trends. This is referred to as Production Value: “the lighting, sound, scenery and props used to improve a film, play or television show” (College Dictionary, 2015). Here, also trends can be recognized. An example is the increased use of drones in television productions (Taylor, 2014). Silvio Waisbord (2004) gives more insight the implementation of format and technical trends. When several hit shows have the same genre, many production companies follow this trend by creating similar shows. When Pop Idol became a success, shows like X-Factor, So You Wanna Be A Popstar and The Voice followed. Afman (2015) agrees with Waisbord: “When a trend is identified in another country or region, a television producer tries to be the first to implement this trend in his own region”. He states that every producer was looking for a new hit show, when the movie Intouchables became a huge worldwide success. However, the success of a show in one country does not imply that the show will be a success in another one. “What worked in private television could not necessarily be applied in public broadcasting systems. For programming trends to become truly globalized, television systems need to be patterned along the same principles” (Waisbord, 2004). Waisbord (2004) and Afman (2015) also discuss the criteria for being considered a trend. Waisbord speaks about a clear pattern. He states that a genre or a format can become a trend, when a show is adopted in many countries and therefore truly globalized. However, Afman has a critical note on this statement: “Many shows are adopted hundreds of times but never became a trend. Producers identify a genre (or show) as a trend when three countries or more are creating similar shows within a short period of time”. Barbara Arena (2001) added another requirement. She states that a form of behaviour can only be a trend if it is followed by a large population for a short period of time. According to Brown’s Dow theory (1998) this period of time is around one year for the main movements. When all criteria are combined, a trend is a show (or genre) aired in at least three countries and developed or being developed within the same year. Jean Chalaby (2011) carried out a research on successful television formats in the world. He counted the amount of hit formats in each country. After, he added the amount of trends that started with one of those hit formats. This resulted in several important discoveries. In the first place he found out that America is the country where most formats are created. Therefore, several of these shows became hits, which ignited format trends around the globe. Besides America, nine other countries ignited a high amount of format and technical trends. These countries are: England, France, Italy, Spain, Germany, The Netherlands, Australia, China and Israel. According to Chalaby, the reason why these countries are so successful in creating trending formats is because of their specialization in one particular genre. While America is specialized in scripted shows, England sold the most comical shows worldwide. To clarify what these specializations are and where these specializations come from, I created a clear overview per country. This overview can be found in the Appendix (Chapter 12.3). I strongly suggest readers to read this overview before reading the Content Analysis. Several existing theories play an important role in this thesis. According to Brown (1998) and his research team, three kinds of trends exist: Major trend, medium swing and short swing. The medium swing and major trends is most common in the television industry. In this industry, these trends are called television trends. Trends can be categorized according to technical trends and format trends (Afman, 2015). Format trends are periods of time in which the audience tends to watch more shows within a particular genre than usual (Redden, 2008). Technical trends are the persisting technical movements in the television industry (Zheng, 2006). To make sure that an international trend will work in another country, systems need to be patterned along the same principles. If a country does not have the same principles, than the implementation of a trend could be a risk (Waisbord, 2004). Afman, Waisbord and Arena (2001) all have theories about the question “What makes a trend a trend?” When combining their requirements (each one), a trend is a show (or genre) aired in at least three countries and developed or being developed within the same year. Most trends have their origins in the same countries. Chalaby (2011) made a list of countries that play a major role in creating worldwide format and technical trends. On this list are the following countries: America (Scripted Series - Action), England (Comedy shows), France (Scripted Series - Drama), Italy (Reality), Spain (Comedy shows), Germany (Scripted Series - Crime), The Netherlands (Reality and Game Shows), Australia (Cooking shows), China (Broad Entertainment) and Israel (Game Shows). To answer the first research question, I will perform a qualitative content analysis. In the literature, I found out which ten countries are the leading countries in the television industry. I will analyse the website of the leading channel (best ratings in the last year) and the leading production company (company with the most productions in last year) in each of those countries. This analysis will be performed with the use of a clear coding tool. In this tool, clear guiding questions are asked, which need to be answered. All the questions refer to the literature. This qualitative content analysis is the most suitable for my project. I cannot do a questionnaire to find out what the trend is at the moment; neither can I do a quantitative study, because you cannot count something unexpected. After I analysed the websites of the most trending TV channels and producers, I will make comparisons and distinctions of the results by creating clear graphs and tables with generalised results (See Findings: Content Analysis). To answer the second research question, I will perform a set of qualitative interviews. To test the impact of the upcoming trends, results will be discussed with several important producers in the Netherlands. These interviews will be recorded and transcribed. Personal Interviews suit my research the best, because professionals know how the market works. Besides that, they also know the impact of certain media trends. My research will be a descriptive case study research with clear comparisons and distinctions in the end. The answers of each section will be generalised to be able to compare the answers with each other in a graph. I chose for this research design because it suits my research in the best possible way. The only way to find new trends is to search for them. I will search for new trends, describe them and finally compare them. The case Television trends will be the central theme of my project. Besides that descriptive content analysis, I will also have qualitative interviews, which fits the design of a case study. My content analysis will be performed on a computer with Microsft Word. Besides that, I will create a clear and guiding coding tool based on the literature. The personal interviews need more material. During the interviews I will use a sound recorder. The recorded material will be used to transcribe the interviews in the best possible way. All transcribed interviews will be attached in the appendix, together with a CD containing the recordings of all interview sessions. According to the literature review, ten countries are leading in the television industry. The literature suggests, that I should search in these areas. Therefore I will perform my content analysis focussing on these countries. I will visit the websites of the leading TV channel in the particular country, but also the leading television producer. The following countries will be reviewed: USA, England, France, Italy, Spain, Germany, The Netherlands, Australia, China and Israel. After I researched new trends, I need to know the impact of those trends in our industry. Therefore, I will interview ten professionals who are active in the industry (producers, format developers, trend watchers and channel representatives). In my qualitative research, all my findings will be written down in a report. This report is based on questions formulated in a coding tool. This tool can be found in the Appendix. The link to the literature is also explained in the Appendix. After I answered the guiding questions (listed in the coding tool) for each country, I can start identifying the trends by comparing the results. These results can be discussed in the next section. In the qualitative interviews, I will transcribe the complete interview and make comparison and distinctions in the end. To make sure that the transcriptions are accurate, I will use an audio recorder. For my qualitative research, I will use a clear and guiding coding tool. This tool will make sure that I keep clear boundaries for my research and that all my information is directly related to the previously studied literature. The coding tool consists of a total of twenty-one questions. These questions are categorised in questions about format trends and questions about technical trends. Besides that sub-categories are created in the form of questions for the producer and questions for the broadcaster. The complete Coding Tool can be found in the Appendix. I strongly recommend to take a look at the coding tool and the relation with the literature. All questions in the coding tool are based on literature. In the Appendix you can find a list that indicates which questions refer to which literature. The information of the content analysis will be discussed by making comparisons and distinctions via clear graphs and overviews. According to the literature, a trend can be discovered if a show or genre is being produced in at least three countries and in the same year. The interviews will be assessed in a same way. If interviewees give similar answers to a certain trend, these are extra interesting. However, when opinions on a certain matter are different, these discussions will also be noted. The interviewees need to be convinced that the recorded material will not be used for public purposes. Winning their trust is the most important matter. A possible limitation can be that the interviewees have no clear opinion about any of my new trends. Besides that, the interviewees cannot answer the same questions, because they all have a different background. In that way, it is possible that the impact on the Dutch market is hard to describe. Another limitation can be, that the data is hard to analyse, because it’s purely qualitative and therefore a bit abstract. The Content Analysis contains a very detailed analysis of each researched country. The Method Section of this research explains how the Content Analysis is conducted. The leading broadcaster and leading producer of ten countries are analysed. This analysis is performed according to a clear coding tool. This coding tool can be found in the Appendix (Chapter 12.2). Both Format trends and Technical trends have been researched. The detailed descriptions can all be found in the Appendix (Chapter 12.3) To make sure that the results can also be understood without reading the full Content Analysis, a brief summary is created in underneath chapter. The results of the Content Analysis can be found in Chapter 5 of this Research Document. Although NBC and Fremantle are both American, they are very different in their genre focus. Fremantle focuses mainly on Game Shows, while NBC has a clear focus on Scripted Media. Besides the popularity of Scripted Media, Travel Formats and Dating Shows are now in production. VOD becomes more important in America. NBC offers a free on-demand service via an all-in-one App. When looking at the technical aspect, Drones are used very often. Scripted Media is very popular in England. Besides Scripted Media, Comedy Formats are also aired and produced a lot. The newest combination in England is a combination of History and Comedy. The BBC also develops its technical side. The BBC app called Iplayer is a full-developed all-in-one app. This app serves as an on-demand system. Besides the App, viewers can also interact via the Red Button. Most of the new BBC shows use a new Frame Rate. Besides that, many Drones are used. The French television uses a combination of foreign shows and French shows. However, many French shows are based on international success shows. Dating Shows are popular. French television is not using drones and a complete VOD service is not developed yet. However, the station TF1 tries to Internet with its viewers by using a lot of Social Media. Reality is very popular in Spain. Big Brother and The Voice are the most promoted and aired TV shows. Dating is also becoming more popular. Telecinco has an all-in-one App that is used as a VOD service. Besides that, the latest cameras and equipment is used. Celebrities are very important in Italy. Many celebrities have their own show. This is called a one-man show. The production value in Italy varies a lot. While some productions use the latest techniques (including 3D television), other productions use out-of-date cameras. On-Demand is fully developed and starts to play an important role in the country. Rai Uno uses an all-in-one App that is used as a VOD service. In Germany scripted series (especially Crime) are very popular. However, celebrities and Reality also play an important role in Germany. Lately, interactive shows are introduced. VOD is fully developed, although Germany has no pay television. The production value is high. Drones and new cameras are being used. Factual Entertainment enjoys much popularity in the Netherlands. Besides that, interactive shows were introduced lately (Game Shows). There are several popular On-Demand channels. However, the Dutch NPO is weak in communication and uses no interactive possibilities (and no Social Media). The production value in the Netherlands is extremely high. Cooking formats are extremely popular in Australia. Besides that Scripted Media (especially USA originated) enjoy also a lot of attention. The production value in Australia is high. Almost all shows have their own Apps. The channel Seven has an All-in-One App which can be used as a VOD service. Many Australian shows use Spycams and Drones. News and information related shows are the most popular television shows in China. However, other popular television shows include Talent Shows and Dating. Chinese formats elements could be experienced as extreme in the western culture. On-Demand is completely developed. The production value in China is low. This means that no new cameras are used. Game Shows and Talent Shows are the most popular genres in Israel. Besides that, Dating is becoming very popular. In Israel, interactivity is used a lot and Apps go along with almost every show. The production value is very high, which means that drones and spycams are used very often. Besides that, VOD is fully developed. In this part of the research document, you can find the results of the content analysis per country/region. For every chosen country, I did a content analysis consisting of two parts: a content analysis focussed on format trends and a content analysis focussed on technical television trends. In the following paragraphs, the most interesting results will be showed. According to the literature, the promotion of a particular genre is related to the popularity and therefore trendiness of a genre. The following question was used in the coding tool: When looking at the website of the channel, what is the most promoted genre? Table 1.0 shows that three of the ten channels promoted scripted more than any other genre. France, American and English television channels promoted scripted the most. Other often promoted genres are news related shows and reality. The following question was used in the coding tool: When looking at the website of the channel, what is the most aired genre? Table 2.0 What is the most aired genre? From ten channels, four channels aired scripted series more than any other genre. Four other channels aired news related shows (including the news itself and news magazines) most. The two other channels had reality as their most aired genre. Reality, news related shows and scripted are not only the most aired genres (see table 2.0), but also the three most promoted genres (see table 1.0). Not only channels promote a particular genre. Also the producers themselves promote a particular genre by placing advertisements on their own website. The ten researched producers are promoting the genres being showed in table 3.0. The ten producers that have been researched produced a wide variety of shows in the last year. What genre did they produce the most? That was one of the questions that were answered by this research. Table 4.0 shows the most produced genre. Table 4.0 What is the most produced genre? Table 4.0 shows the answers to the question: what is the most produced genre by the researched production companies? Three producers produced mostly scripted shows. After scripted shows, two producers created mostly Game Shows. The five other genres are Talent Shows, documentary shows, cooking shows and celebrity one-man shows. This last genre is a genre that can only be found in Italy. The three producers with a preference for scripted material were producers from Germany, England and China. All researched channels aired new shows. Table 5.0 shows the genres of the latest channel additions. This means, that in total ten new international shows have been researched. Table 5.0 What is the latest genre? Of all ten new shows, three shows were dating formats. China, Spain and France all aired a new dating show. Other genres that are being aired lately are reality and history related shows. The last one is usually labelled as a documentary series, however the direct link with history was so clear, that the label history show was created. Every year, new genres are born. Usually these are combinations between existing genres. In order to find these new genres the following question was asked: “What new genre is being promoted?” Table 6.0 shows the results. Four of the ten researched channels did not air a new genre. However, six channels did air a genre that has not been aired before. The following new combinations have been found: Reality-Experiment, Comedy-History, Live Dating, Interactive Game show, Dating-Adventure and Dating Travel. Because these genres are rather new, a clear explanation of the new genre is needed. The genre Reality-Experiment is a genre in which a group of people is followed during an official social experiment. While a show as Big Brother also could be labelled as an experiment, the shows in this new genre only focus on official experiments known by social researchers. Besides that, a whole season focuses on only one social experiment guided by a researcher. The genre Comedy-History a comedy shows with a clear theme: history. The genre tries to make history fun, by doing sketches, voice-overs and other fun material. Live-Dating is a genre in which a dating show is performed live on television. This genre differs from the dating genre because of the direct impact of a live broadcast. The viewers can directly participate in the dating show, by visiting the studio within the airtime of the show. An Interactive Game show is a game show in which the viewer can participate via a live application on their mobile phone, tablet or computer. Dating-Adventure is a combination of dating and adventure shows. In these shows, people have to survive together with the goal to create a stronger bond, often resulting in a relationship. The new genre Dating-Travel is a combination between a dating show and a travel show. In these shows, the world of dating is explained by letting couples travel together. These kinds of shows are not just dating shows because of the fact that the couple’s show the places they visit in a travel show style. While six new genres have been identified, a clear pattern in these new genres can be found. Three of these new genres are related to the original dating genre. Two new genres are directly related to new interactive shows, which the audience participates in. The live-dating show and the Interactive Game show both have a key role for interactivity. (1) Old-Timer Repair Element: Repairing old-timer cars and bringing them back to their old state. In this format element, cars are not repaired in the style of Pimp My Ride, however extreme old cars with no ability to drive anymore are being repaired and renovated to get the same look that they once had. (2) Comic House Element: Format element in which a group of comic fans are placed in one house for the sake of reality television. (3) Striking Death Element: Actors re-enact the most striking deaths of history. (4) Restaurant Judging Element: Format element in which a jury gives grades to separate parts of a restaurant instead of the restaurant itself (example: grade for the kitchen, grade for the decoration etc). (5) 1 VS 100 Addition Element: New additions for the show 1 Vs 100 (Endemol). (6) Reviving Collapsing Houses Element: Format element in which an expert will revive almost collapsing houses or buildings. (7) Eulogy from host Element: Host will give a eulogy to the winner. (8) Politician Host Element: Format element in which a politician shows local villages in the country. (9) Who is Single Element: Element for dating shows in which a group of girls does not know who the single guy is that they can date. (10) Party Competition Element: Format element in which two teams have to compete to give the best party. (11) All Round Artist Element: Search for best all-round artist instead of singing or dancing only. (12) Best Imitator Live Element: Format Element in which viewers can vote for the singer who imitates a famous artist the best. The voting is done via a mobile app. (13) Live Game Show App Element: Format Element in which the viewer can live participate in a game show via a mobile app. (14) Desert Chef Element: Format Element in which contestants try to become the next desert chef. (15) Flying Money Element: Format Element in which money flies away when it is lost. (16) Married Celebs Element: Format Element in which celebrities live together as a married couple. (17) Ancient Recipe Element: Format Element in which extreme old recipes are cooked in a modern way. (18) History Related Sketches: Format Element in which historical moments are sketched. (19) Cube Element: Format Element in which contestants will enter a magical cube. (20) Host to Social Problem Element: Format Element in which Facebook serves as a tool to send a host to problems in society. (2) Big Beautiful Girls: An overall Theme in a show in which a clear message is given: be proud of being a bigger girl. (3) Dating – Adventure Theme: Overall new Theme in which a dating show is combined with surviving in the wild nature. (4) Game Show – Hidden Camera Theme: overall Theme in which Game Shows are combined with hidden cameras. (5) Celebrity Cooking: Overall Theme in which celebrities learn to cook. (6) Live Dating Theme: Overall Theme in which the audience can interact live with a dating show. (7) Overall History Theme: Overall idea of creating a show that tells the whole history of a country. Table 7.0 shows that nine of the ten channels use an app classified as an All-in One app. This is an app that combines Video On Demand (VOD), Live Viewing and communication possibilities. China is the only country that provides no Apps on their website. In all other countries it is possible to view favourite channels and shows whenever and wherever. Ten international channels have nineteen interactive possibilities together. Four channels used a special application that viewers can use to vote. With this app viewers can vote for their favourite star in a Talent Show, they can vote for their favourite character on a series or they can vote for the funniest home video. The Apps are created for the whole channel and not for a separate television show. Seven out of ten channels uses separate social media pages to promote their channel and their shows. The difference between separate pages and all in one social media page is the following: separate social media pages occur when a channel created a page on Facebook, Twitter and other social media. However, all-in one social media occurs when a channel created a webpage with all their relevant social media contributions collected in one space. This last interactive strategy is used by only one channel. Three out of ten channels created a special page on their website with a discussion platform. Here, fans can discuss their favourite shows of the channel. Other interactive possibilities that were found were: games, newsletters and chat functions. Table 9.0 shows the channels (and countries) and the amount of interactive possibilities they offer.The channels (and thus countries) with the most interactive possibilities were TF1 (France) and Seven (Australia). Both channels provided three possibilities to interact with viewers. The channels with the least interactive possibilities were NPO1 (The Netherlands) and Telecinco (Spain). Both channels only provide one interactive possibility: separate social media pages. Ten channels (countries) owned shows where together seventeen new production techniques could be identified. Five channels (countries) had shows with the newest frame rate (48 frames per second). This is exactly fifty per cent of all the researched channels (countries). Two channels produced shows that used the newest Go Pros in very creative ways. For example a go pro in a fridge, on the roof of a house or on other interesting positions. Four channels (countries) aired shows, which made use of the newest drones. While drones are considered as expensive, forty per cent of all the researched channels produced shows with drones. While 3D television is very popular in cinemas, only two channels aired 3D filmed television shows. Chapter 5.2.3 showed the new production techniques recognized while watching television shows of ten different channels. However, the content analysis also focussed on the shows of ten different producers. Table 11.0 shows an overview of new production techniques identified while watching several shows of ten international production companies. Six of the ten researched producers used the newest frame rate (48 frames per second). This is sixty per cent of all the researched production companies. The use of drones is the most supported new technique by producers. Seven out of ten producers used drones in their shows. Only two international producers used no new technique at this moment. The findings show that scripted television is an important factor in the actual television industry. Table 1.0 shows that three of the ten researched channels promote scripted more than any other genre. The scripted genre is not only the most promoted genre, but also the most aired genre of all. In four researched countries, scripted shows are aired more than any other genre (see Table 2.0). This means that scripted material enjoys the same amount of popularity as news related shows (including the news itself). The important role of scripted material is also visible when looking at the findings of the production companies. Scripted material is (together with Talent Shows) the most promoted genre among television producers (See Table 3.0). The high popularity of scripted material results in a very high production of scripted shows. Of all ten researched production companies, scripted material is the most produced genre (Table 4.0). This is extremely interesting, especially because all researched production companies are production companies producing both scripted as non-scripted material. Apparently, the popularity of scripted material makes production companies chose for a higher amount of scripted productions material instead of non-scripted productions. According to the literature a trend is a show (or genre) aired in at least three countries and developed or being developed within the same year. The genre scripted is being aired (Table 2.0) and produced (Table 4.0) in four countries around the world (within the boundary of the year 2014-2015). Besides that the promotion of scripted material also occurred in three different countries within the same period of time. Therefore, the genre scripted meets the requirements for being considered a trend. The promotion and creation of scripted content is a worldwide trend at this moment. Table 5.0 shows the interesting results to the question: what genres are being aired lately? In this question, only the newest additions are being looked at. The table shows that the genre Dating shows much potential. In China, Spain and France dating shows are added to the list of new television shows. But the rising popularity of the dating genre is also recognized in Table 6.0. This table shows newly created genres around the globe. Three of the six newly identified genres are directly related to the dating genre. The three new genres are Live-Dating, Dating-Adventure and Dating-Travel (explanations can be found in chapter 5.1.6). Fifty per cent of the newly created genres are dating genres. This is absolutely remarkable, especially because dating formats are not among the most aired and promoted genres in the last year. According to the literature a trend is a show (or genre) aired in at least three countries and developed or being developed within the same year. The genre dating has been aired in at least three countries (Table 5.0) and has been developed in the last year. Besides that, the popularity of the genre resulted in the identification of three subgenres around the world (Table 6.0). Therefore, the genre Dating meets the requirements for being considered a trend. The creation of dating shows and new dating formats is a worldwide trend. History is usually seen as a theme for documentaries and infotainment shows. However, the findings show that the popularity of history in combination with other genres (such as humour) is rising. Table 5.0 shows that two out of ten new television shows are historical related (non-scripted) television shows. Besides that, Table 4.0 shows that ten per cent of the actually produced television shows is within the historical genre. This is high, especially because other popular genres such as Talent Shows and Reality enjoy the same percentage. The fact that history also appears in the list of new genres is another sign of the rising popularity for the genre. One genre (out of six new genres) is called Comedy-History. This genre combines comedians with historical figures and moments. The content analysis describes several shows within this genre worldwide. An element of one of these shows is described in chapter 5.1.7 (format elements). The format element description states the following: “Format element in which historical moments are sketched”. According to the literature a trend is a show (or genre) aired in at least three countries and developed or being developed within the same year. According to the performed content analysis, this is not the case. Therefore, History cannot be claimed to be a genre trend. However, the potential of the genre is duly noted. Table 6.0 shows the list of newly identified genres. Two of the six new genres are directly linked with the term interactivity. Live-Dating is a genre in which a dating show is live broadcasted on television. The goal of these kind of shows is to attract viewers to come to the studio during the broadcast, to find the love of their life. The other genre related to interactivity is Interactive Game Show in which the audience at home can join a game show by using an application. The fact that thirty-three per cent of all new genres are related to interactivity is not the only notable fact. When reviewing the list of unique format elements and unique themes (chapter 5.1.7), several elements and themes are directly related to interactivity. In one format element (See number 12) the audience is the jury by voting via a mobile application. Format element number 13 is also an interactive format element where the audience can participate live in a game show. Format element 20 is the last format element in the list of recognized new elements that shows a relation with interactivity. In this format element, Facebook serves as a tool to communicate with the hosts of the show. The fact that interactivity is represented in three new and unique format elements around the world shows the rising importance of interactivity. According to the literature a trend is a show (or genre) aired in at least three countries and developed or being developed within the same year. This also applies to general movements and show elements. The fact that interactive format elements are part of three different shows around the world (according to research chapter 5.1.7) means that interactive format elements can be seen as a worldwide media trend. Besides the recognized trends (Scripted series, Dating, Interactive format elements) and almost-trends (History related shows) other format related findings are interesting. According to Table 3.0 Talent Shows are important for the image of producers. Three out of ten producers promoted their Talent Shows more than any other genre. The fact that Talent Shows remain important in the media landscape is quite interesting given the fact that Talent Shows are not in the list of most aired genre at this moment (Table 2.0). Only one of the ten producers produces more Talent Shows than any other genre. This means, that nine other television producers have more important genres within their production company than Talent Shows. This statement matches with the statistics of Table 5.0, which shows the ten newest additions to the worldwide channels. One out of ten new shows is a Talent Show. This is a quite low number in comparison with the high promotion standards for the genre. Table 6.0 shows that no new Talent Show variant is recognized among the new genres. It seems that the power and importance of Talent Shows in the media landscape is slowly decreasing. According to the findings, social experiments are gaining popularity. Table 6.0 shows that one new genre (out of six new genres) has the title Reality-Experiment. Besides that, the Format Theme overview in chapter 5.1.7 shows an interesting list of experiments used as a basis for television shows. One of these experiments is the American housing trend called Tiny House Movement.  In this experiment, an American citizen tried to live in a tiny house comparable to a caravan. Because of the huge success of this social and practical experiment, many Americans followed his lead by creating their own tiny house. This resulted in a television show about this new phenomenon. Another notable experiment is the experiment in which Facebook serves as a tool to send a host to problems within the society or neighbourhood. The content analysis resulted in several format trends. The promotion and creation of scripted television series was a clear television trend. Besides that the creation and airing of the dating genre is a new recognized trend. Interactive elements are also considered to be format trends. More and more television shows use interactive elements to give the viewer the chance to interact with the show that they are watching. While the following are not recognized trends, their upcoming popularity is noted: history related television shows and social experiments. Another interesting result was the clear decrease in popularity of Talent Shows among channels, while producers are still producing them. Table 7.0 shows that nine out of ten countries uses an app called All-in one app. This is a combination between a Video On Demand (VOD) app and a live viewing application for computer or mobile devices. This means that production companies should take in mind that ratings will not always represent the actual viewing percentages. Usually ratings only take regular viewers into account instead of all viewers including online viewers and VOD viewers. According to the literature a trend is a show (or genre) aired in at least three countries and developed or being developed within the same year. This part of the literature is translated towards technical trends; a technical trend is a technical change that was recognized in at least three countries and being used within the same year. Because the All-In One App is used in nine countries within the last year, this app is considered to be a technical television trend. Channels give more and more possibilities to interact with the channel and its shows. Table 8.0 shows the interactive possibilities offered by the researched channels. The most important interactive possibility is social media. Eight out of the ten researched channels (countries) used social media to interact with viewers. The second most popular interactive possibility is a special designed voting app. Via this app, viewers can vote for a numerous kind of things such as their favourite singer, their favourite moment in a show or even how a series should end. A television production company does not develop these types of Apps but the channels produce them. Three out of the ten researched channels used a special designed discussion platform to give the viewer the possibility to discuss their favourite television show. According to the literature, a technical trend is a technical change that was recognized in at least three countries and being used within the same year. The Voting App, the use of social media and discussion platforms are all three used by at least three channels (and thus countries). Besides that, they are all three used and developed within the last year. Therefore all three interactive possibilities are considered to be a technical television trend. It is interesting to see the origin of the researched channels. Which channel, and thus country, provided the most interactive possibilities on their website? Table 9.0 shows that France and Australia both provide three different interactive possibilities. What is significant is that the Netherlands (together with Spain and China) provided only one interactive possibility: social media. This is much lower than most other channels and countries. The technical side of television is not only about interactivity and Apps but also about the way that a show is created. Table 10.0 shows the new production techniques used by shows of ten international channels. It is remarkable that the use of the newest frame rate (48 frames per second), which is actually a frame rate used by film makers, is now also used by more than fifty per cent of the major channel shows. While the newest frame rate was introduced in 2013 (the movie The Hobbit: Desolation of Smaug was the first movie to use it), the 3D television, which introduced in 2009, is less popular in the actual television industry. Only two out of the ten researched channels broadcasted shows in 3D. A more popular production technique is the use of the newest drones. Four out ten researched channels made use of the newest drones in their shows. Drones are flying cameras that make camera shots in the air. According to the literature, a technical trend is a technical change that was recognized in at least three countries and being used within the same year. The use of the newest frame rate (48 frames per second) and the use of the newest drones are both used in at least three countries and are all used within the same year. Therefore both are considered to be technical television trends. Three out of ten channels used no new production techniques. Besides channels, also the producers were researched. When comparing Table 10.0 (Channels) to Table 11.0 (Producers) one significant difference is clear: all recognized production techniques in Table 10.0 are used more in Table 11.0 only the use of 3D television does not increase as much as the rest. The other figures show much resemblance to the results of Table 10.0. The use of go pro cameras and spycams increased. However, the use of the newest frame rate and the newest drones increased also. Only one producer used no new production technique. Two new technical trends can be added to the list of new recognized trends: the use of multiple Go Pros and spycams is recognized in at least three countries within the same year. The content analysis resulted in several interesting technical trends. The use of the all-in one app by channels is a newly recognized trend. Other interesting trends are the Voting Apps and the creation of discussion platforms. The use of social media pages connecting to channels and shows is also a recognized trend. When it comes to creating the shows, the use of the newest frame rate and new drones is both trending. Other production related trends are the use of multiple Go Pros simultaneously and the use of modern spycams. This thesis works with two research questions. In order to answer the first research question, a content analysis had to be conducted. When the trends are identified, the second research question can be answered. This question is the following: “How will the researched trends influence the Dutch television market?” In order to answer this research question, ten personal interviews have been conducted. The ten interviewees are chosen very carefully. All of them have a clear relation to the topic. Besides that, all of them have a major task in the television industry, which makes them suitable characters to give an insight in the possible influences of the discovered trends. A description of each interviewee can be found in the Appendix. The results of the interviews will be discussed according to the trends that were found in the Content Analysis Result Section. The complete individual interviews can be found in the Appendix. The content analysis showed that scripted media has a very high popularity standard nowadays. All ten interviewees were asked if they recognized the same trend in the media environment. All interviewees recognized this new media trend. However, the reason why scripted media is so popular nowadays was explained in various ways. Some interviewees stated somewhat the same. Interviewee 1, Interviewee 4 and Interviewee 9 both stated that the popularity of Scripted Media depends on the fact that producers can keep the tension and action in scripted media, while reality is unpredictable. “Reality is sometimes too boring and it can lose the flow like in the show Big Brother. With a script, you can control this by yourself” stated Interviewee 1. Interviewee 4 agrees with her: “It is easier to tell a good story, because you can come up with it yourself. You can make it exactly like you want. If you go for non-scripted, you depend on the reality. This is always different than you hoped”. Interviewee 9 concludes with a comparable statement: “The quality of a drama series is that you can write the whole series. You can let the characters do whatever you want. In a reality show or another show, a show is not active and entertaining during all minutes. Sometimes you have dips or an episode is a bit less entertaining than a previous one. In drama you can create your own fireworks by creating a good script”. It is interesting to see, that the three professionals who agree with each other all share the same function in their company. All of them are main responsible for the creative process.